Michelle has been away on business all week so it has just been Sean and myself home for dinner each night and I let Sean choose some of the meals we would have this week. Naturally he chose things like burgers and pizza but he also wanted us to have some fried calamari this week for dinner. 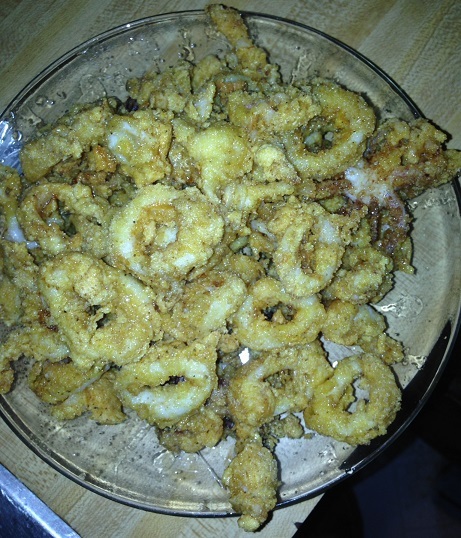 I love fried calamari myself, whether as an appetizer or as the main course, so I decided to make some for dinner for us and I found this recipe from Chuck Hughes on the Cooking Channel that was some calamari with a nice puttanesca dipping sauce. It seemed very easy to make and looked delicious so I decided to give it a go. For the calamari, clean the calamari and cut the bodies into thick rings, reserving the tentacles separately. Mix the milk and the lemon juice in a large bowl. Let the mixture rest for 5 minutes until it thickens. Add the hot sauce. Add the calamari and allow it to soak in the buttermilk for up to 4 hours. In a separate medium bowl, mix the flour, 1 teaspoon of salt, 1 teaspoon of black pepper, the paprika and the cayenne pepper until blended. In another separate medium bowl, beat the eggs. Remove the calamari from the buttermilk and allow it to drain. Dip the calamari into the beaten egg and then into the flour mixture to dredge it. Fill a large, heavy skillet or Dutch oven with 2 cups of vegetable oil and heat the oil over medium-high heat until it registers 360 degrees on a candy thermometer, or if you are using a deep fryer, set the deep fryer to 360 degrees. Fry the calamari, in batches, until they are golden brown and crispy, about 4 minutes. Place the calamari on a plate and pat them dry with paper towels to remove any excess oil. Sprinkle the calamari with salt and pepper. Serve with the puttanesca dipping sauce and lemon wedges. For the Puttanesca dipping sauce, heat the olive oil in a medium saucepan set over medium heat. Add the shallot and saute for 2 minutes. Add the garlic, tomato paste, anchovies, chopped olives, capers and tomatoes. Saute the mixture, stirring occasionally, for another 5 minutes. Season the sauce with salt, pepper and the chile flakes to taste. If the sauce seems a little thick, add a little bit of water and mix to thin out the sauce. Stir in the parsley and the lemon zest and serve. you end up with crispy and tasty calamari and the dipping sauce was great. The mix of the anchovy, olives, capers and tomatoes were perfect and made a great compliment to the calamari. Of course, you can always just use buttermilk if you have some on hand instead of making your own as the recipe does, but many people do not always have buttermilk on hand so this is a good quick fix for that. As I said, this is great as an appetizer or an entrée, and we had it for dinner with some rice and vegetables to round out the meal. I forgot to take a picture of the sauce, but trust me, it comes out very tasty and fragrant.